The “Southern Gas Corridor” CJSC is expected to allocate about $1.3 billion to finance Azerbaijan's share in the Southern Gas Corridor project. Director General of the CJSC Afgan Isayev said that this year it is planned to spend $232 million on the Shah Deniz project (including Shah Deniz 1), the South Caucasus pipeline / South Caucasus pipeline expansion - $144 million, TANAP - $728 million and TAP - $182 million. In order to ensure the delivery of Azerbaijani gas to the European markets, Azerbaijani President Ilham Aliyev signed a decree in October, 2013, establishing a State Commission with the purpose of ensuring state control over and providing state support in regard to the effective implementation of the full-field development of Shah Deniz gas-condensate field, South Caucasus Pipeline Expansion, implementation of Trans-Anatolian Pipeline (TANAP) and Trans Adriatic Pipeline (TAP) projects. Subsequently, the head of state signed a decree dated February 25, 2014 on the establishment of “Southern Gas Corridor” CJSC with the purpose of consolidating, managing and financing the state’s interests in these projects. SGC was founded by the Ministry of Economy of Azerbaijan (51 percent) and SOCAR (49 percent). The Southern Gas Corridor is one of the priority energy projects for the European Union, which aims to diversify routes and sources of energy supplies and thereby improve the energy security of the EU. 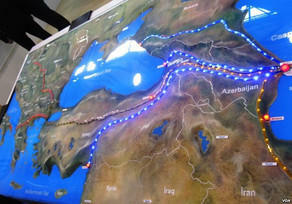 The Southern Gas Corridor is intended to deliver gas from the Azerbaijani gas condensate field Shah Deniz to Europe. Gas as part of the second stage of the field development will be exported to Turkey and the European markets through the expansion of the South Caucasus gas pipeline and the construction of the TANAP and TAP gas pipelines. The first gas within the Shah Deniz-2 project will be delivered to Turkey in 2018, and to Europe in 2019. The cost of the Southern Gas Corridor project is estimated at $41.5 billion.